Camping with a baby?? Is this even possible or fun? Summer has officially started and it’s time to get in the spirit! In one of my recent posts that discussed fun ideas for the first day of summer, I mentioned going camping. 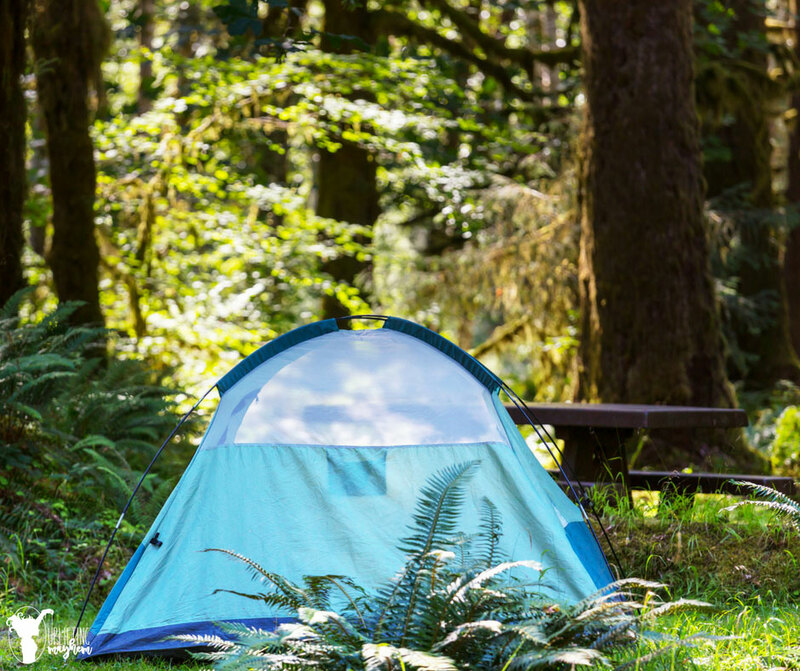 Camping is such a fantastic summer activity! It’s cheap, adventurous and family-friendly. When it comes to camping with a baby, location is everything. You may be tempted to take your family to the most scenic campground you can find, but those aren’t always baby-friendly. There are two things that you should keep in mind regarding location: its distance from your home and any potential dangers. While it’s likely that your trip will go well, there is always the chance of something going wrong or of you forgetting something important at home. For this reason, it’s best to stay close to home on your first few camping trips with baby- just in case. In regards to the specific campground you choose, it might be best to stay away from those picturesque streams and cliffs with the great views. When you have small children, especially a baby that’s crawling or walking, what may be scenic to you could be dangerous for them. Until they’re a bit older, stick to campgrounds that are inland and relatively flat. As you may have expected, camping with a baby requires quite a bit of preparation; but trust me, a few extra hours spent packing could save you from making an extra trip home in the middle of your camping adventure. If you’re camping with a baby for the first time, there are several extra items that you should pack. First of all, diapers are important. Keep in mind that if you bring disposable diapers, you’ll need to carry them around with you until your find a trash can. Here are some bags to store them in until you find a garbage. Another option is to purchase compostable diapers, but those are typically only necessary for long camping trips. Extra clothes for the baby to sleep in is also a must. Your baby will likely spend most of their day strapped into a baby carrier while you’re trekking around, which means that they’ll be extra sweaty. Depending on where you’re going camping and what the weather will be like, you should also pack some extra clothes or a blanket to make sure your baby doesn’t get too cold. As a responsible adult, bug spray is likely already on your packing list. While bug spray is an important item to bring for yourself, did you know that it could be toxic to babies? DEET-based bug repellents- the most effective kind- shouldn’t be used on babies under the age of six months. And even older babies shouldn’t be overexposed to bug repellent; if needed, only small amounts on exposed areas of skin are permissible. However, bug repellent on infants is one of those things that just isn’t worth the risk. That’s why when you go camping with a baby, you should bring some lightweight bug netting. It’s crucial to protect your infant from bug bites, as their skin and immune systems are much weaker than outs. Bug netting is a great way to keep them- and you- protected from any pesky insects without risking your baby’s health. This camping trip may be the first time that your baby has ever slept outside of their crib! While this is exciting for both you and baby, it’s still a big change. Infants oftentimes find it easier to adjust to change when they have access to something familiar. When taking baby on their first camping trip, it could be helpful to bring one of their favorite toys or blankies. If they start to get fussy- especially near bedtime- giving them this little piece of home could help them feel more relaxed and comfortable on the campground. Last but not least, relax. Between the planning and the new experience for baby, you can become pretty stressed before you even make it to the campground. Especially if this is your baby’s first outdoor trip, you’re probably worrying obsessively about everything that could go wrong. What if they cry at night and wake up other families on the campground? What if I didn’t bring enough diapers and have to go back? What if the baby hates camping? Ignore all of these questions. More often than not, parents are the nervous ones during a baby’s first camping trip, while the babies are curious and content. Sit back and enjoy watching your baby experience something new instead of worrying about what could go wrong. Chances are, nothing will. With our warm weather, the relaxed atmosphere and 4th of July just around the corner, there’s no denying that summer is here! When you have small children, summer is such a magical time. They get to spend more time with their friends and try new things- like camping- that they don’t get to do in the colder months. This summer, make it a goal to plan a camping trip for the whole family- baby included! It may seem overwhelming to plan at first, but once you’re out in the wild, enjoying the crisp, fresh air and the great outdoors, it will all be worth it.